EU06 design was, to a certain extent, based on BR class AL3 (later 83). This E3035 was photographed in Doncaster on July 27, 2003, by Phil Scott (source: www.commons.wikimedia.org). E3035 is the sole preserved locomotive of this type. EU06-05 at the Warszawa Wschodnia station, 1962. Photo from my collection. 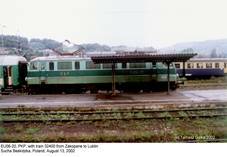 EU06-20 at the Sucha Beskidzka station; photo taken on August 13, 2002. EU06-02, photographed at the Chabówka station on July 29, 2006. 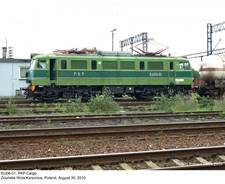 Again EU06-02, this time at the Kraków Płaszów depot; September 9, 2006. In June 2007, EU06-20 hauled the Orient Express! This photo was taken at the Warszawa Gdańska station on July 14. Photo by Marek Graff (thanks for permission!). EU06s that still remain in service are not frequently encountered with freight trains. This photo of the EU06-01 was taken in Zduńska Wola Karsznice on August 30, 2010. EU06-13, photographed in Kraków in 1983. The identity of the second locomotive is not known. Photo by Krzysztof Słowikowski (from my collection). 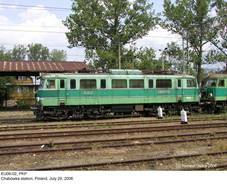 First electric locomotives in PKP service were of British origin. 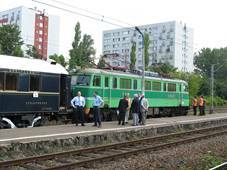 Following the contract for the electrification of the so-called ‘Diameter Line’ in Warsaw, signed between PKP and two British companies (English Electric and Metropolitan Vickers) in August 1933, two machines were supplied, first of them arriving in 1936. Four more were later assembled by Fablok. All were classed EL.100; last of them survived the war and was withdrawn in 1964. After WWII, electrification of principal lines soon gained momentum, but production of locomotives posed a serious problem. Given the needs of industry reconstruction and expansion, it is hardly surprising that freight machines were given priority: indigenous ET21, to some extent based on Soviet VL22M, appeared in 1957 and Pafawag of Wrocław (pre-war Linke-Hofmann) built 726 examples until 1971. Supplies of passenger locomotives were far less impressive. E110 (later re-designated EP02) prototype was rolled out in 1953, but only eight machines were built; this locomotive, based on pre-war EL.100, could hardly be considered modern. Eight E150s from Swedish ASEA, supplied between 1951 and 1952, stemmed from the same basic design and offered no significant advantage. These locomotives were in fact considered a stop-gap. Twenty-five EU04s from Eastern Germany, purchased in 1955 and 1956, proved rather unreliable and disappointing. In fact, from the very beginning it had been assumed that electric locomotives were to be built in Poland. Due to lack of experience with such machines, it was decided to purchase a license. In 1955 a specification for a universal locomotive, capable of hauling a 650-tonne draft at 125 km/h or a 2000-tonne draft at 70 km/h, was submitted by PKP. After initial negotiation with Swiss and Austrian companies, the choice once again fell on English Electric and Metropolitan Vickers, mainly due to favorable terms of payment. 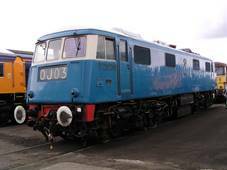 New locomotive owed something to class AL3 (later re-classed 83), then under development for British Railways. 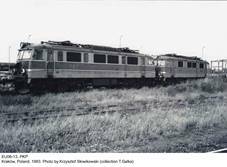 Eventually fifteen locomotives of this type were built and last three were withdrawn in 1989. 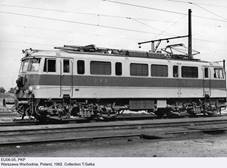 The contract, signed in 1959, stipulated that PKP would purchase twenty British-made locomotives. First of them was completed at the former Vulcan Foundry works in December 1961 and arrived in Poland in February 1962. First test rides took place at the Kraków Płaszów depot in April. All remaining machines were accepted during 1962, with the exception of the last example, which was accepted as late as in July 1965 – the delay had been caused by necessary modification of electric motors. They had serial numbers from 3185 to 3204 and all had ‘1961’ given on name plates as the year of manufacture, but according to PKP rosters nine were built in 1961, ten in 1962 and one in 1964. These locomotives were classed EU06, which implies an universal locomotive, but from the very beginning it was clear that they had been intended almost exclusively for passenger traffic. In fact, during their last years in service they occasionally ran with freight trains. All twenty examples were assigned to the Kraków District Management and those surviving have remained in southern Poland until today. Modifications were few and limited to minor details. At the time of its introduction, EU06 – commonly nicknamed ‘Anglik’ (Englishman) – was considered a modern locomotive. Compared to most of its predecessors, it was characterized by good running qualities, high reliability and good workmanship quality, considered better than that of first license-built EU07s. This class has not, however, been particularly lucky: until early 2011 six examples have been written off as a result of crashes (EU06-03, -06, -09, -13, -15 and -19). After PKP had been split into several companies, EU06s were taken by PKP Cargo. Last scheduled passenger train was hauled by the EU06-08 in March 2006 and it was intended to withdraw this class from use. Later, however, eight EU06s underwent major overhauls and were restored in service; they were encountered with freight and passenger trains from time to time. There are rumours that EU06-01 has been intended for preservation, but it still remains in use. In December 2010 seven examples, withdrawn in mid-2006 (EU06-02, -04, -05, -08, -11, -14 and -16) were scrapped in Kraków and the remaining seven were intended to remain in service until 2012. Currently (February 2019) these seven locomotives still remain in the PKP Cargo inventory, but all are kept in reserve. Some of them from time to time run with special trains. 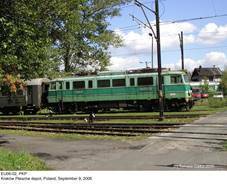 EU06 had a decisive influence on the design of passenger electric locomotives in Poland. Its license version EU07 and slightly modified variant EP07, still remain the mainstay of the PKP fleet. EP08 was its direct derivative, differing – apart from minor details – only in shaft bearings. Many design features were used in ET22 freighter (including traction engines) and EP09 express locomotive. The importance of EU06 for Polish railways cannot thus be underestimated.